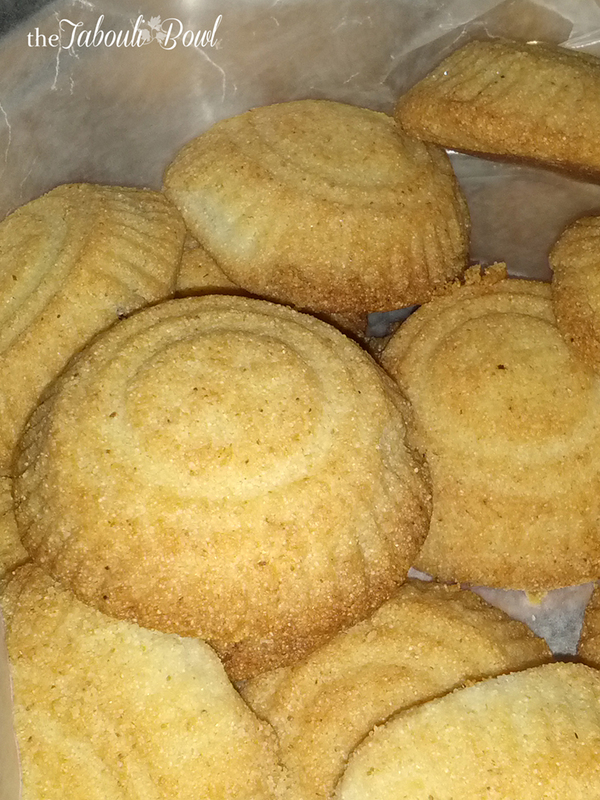 The Maamoul stuffed cookie is a rose water infused, butter semolina cookie, traditionally made in times of celebration. The cookies are stuffed and pressed into unique molds each shaped a little differently to hint as to what’s inside. The three most authentic stuffings are date, walnut and pistachio. We have been testing out our recipe to create a lighter more crumbly cookie that required less rest time. One of the first challenges we faced was successfully using a mold with a softer dough. We found that after switching from oiling the mold to dusting it with flour and having many failed attempts, that there is nothing more frustrating for a baker than a maamoul stuck in a mold. It took some trail and error and a few tears but it was finally discovered that the best way to mold a softer dough is by pressing it in semolina first! Sometimes you need to give the mold a little tap to release the cookie but we found that with this method that’s seldom the case. This recipe yields about 3 dozen maamoul depending on the size of your mold. You might look at that and think that’s too many cookies, and that’s fine you can easily half the recipe. We on the other hand usually double or triple the recipe. When making the maamoul simplify the process by using a kitchen scale. you want a stuffing to crust ratio of a little over double crust to stuffing. For example when making the date stuffed cookies we used 20 g crust to 8 gram date. We keep the scale in font of us the entire time we’re prepping the maamoul which takes the guess work out of molding and makes a uniform cookie every time. 1. Mix semolina, flour, spices (nutmeg, mahlab) and sugar together in a mixing bowl. 2. Cut butter into mixture until a fine and even consistency is formed, rest dough for 10 minutes before moving on to next step. 3. Add 1 Tbsp rose water and knead into dough to from soft ball. Tip: If dough feels dry slowly add more rose water 1 tsp at a time. 5. Let dough rest for 30 minutes in cool space or refrigerate. 2. 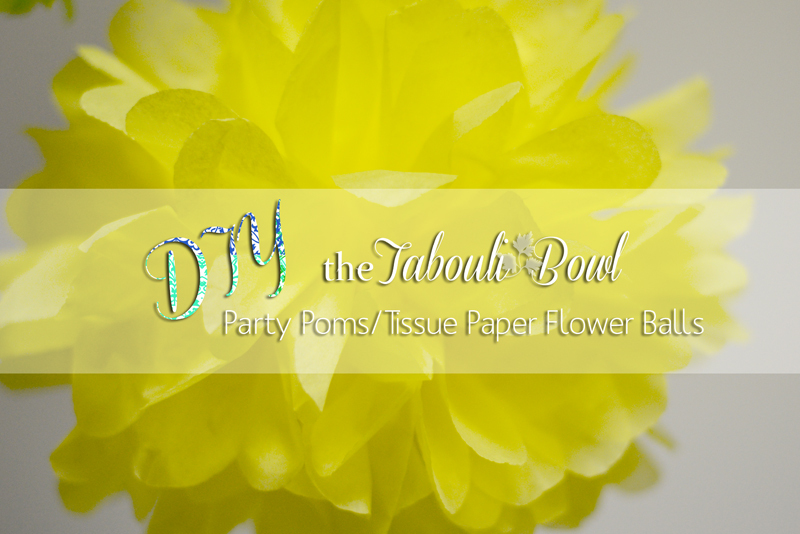 Form into small balls to stuff into dough – this will save time later! *Tip: Wetting hands when forming balls simplifies this process! 1. Place ingredients in food processor and pulse to semi-coarse consistency. Set aside. 7. After dough has rested, divide dough into equal size balls. Tip: Use a scale to weigh even proportions of dough and stuffing to get consistent results. 8. Form cavity in dough ball and place prepared date balls inside. If using nut mixture, spoon nut mixture inside. 9. Gently close up dough ball and seal. If using an oval mold ( usually for pistachio maamoul) it is easier to gently mold dough ball into an egg shape before placing in mold. In the case of large date maamoul mold an easy tip is to divide dough ball in two and flatten into circular pancake shapes and put flattened date balls in the middle. Seal in date stuffing to form disc shape before placing in mold. 10. 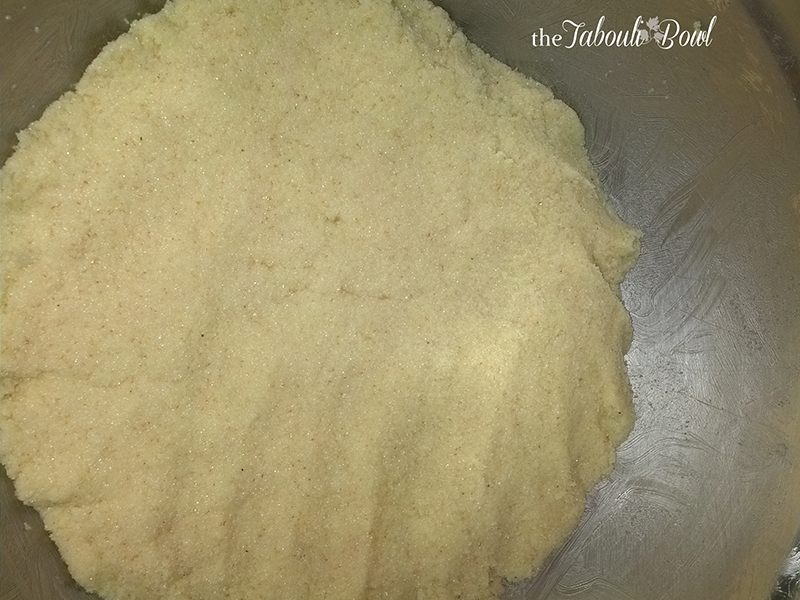 Dip dough into semolina before gently pressing into mold. 11. Tap mold onto clean surface to remove maamoul and place maamoul onto baking sheet. 13. Bake at 350 for approximately 20 minutes. 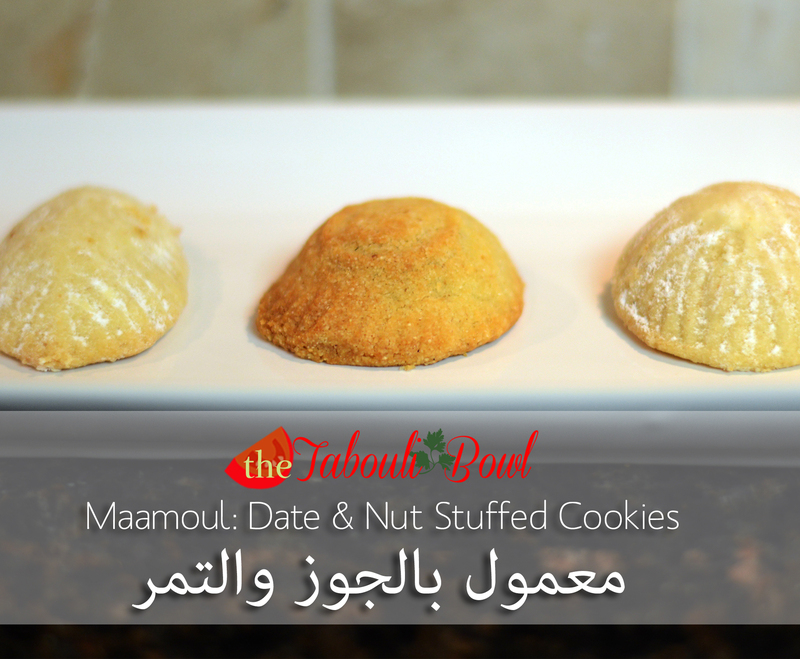 When making nut maamoul, avoid browning, alternatively add 5 minutes for browning of date maamoul. 14. Once cooled sift powdered sugar onto nut stuffed maamoul. 15. Maamoul can be stored in an airtight container at room temperature for up to a week. They can be frozen for up to 3 months. Let us know what you think of this recipe, and make sure to connect with us on Facebook! That is the best recipe I found, WELL DONE. Thank you so much Huda! Share a pic with us!